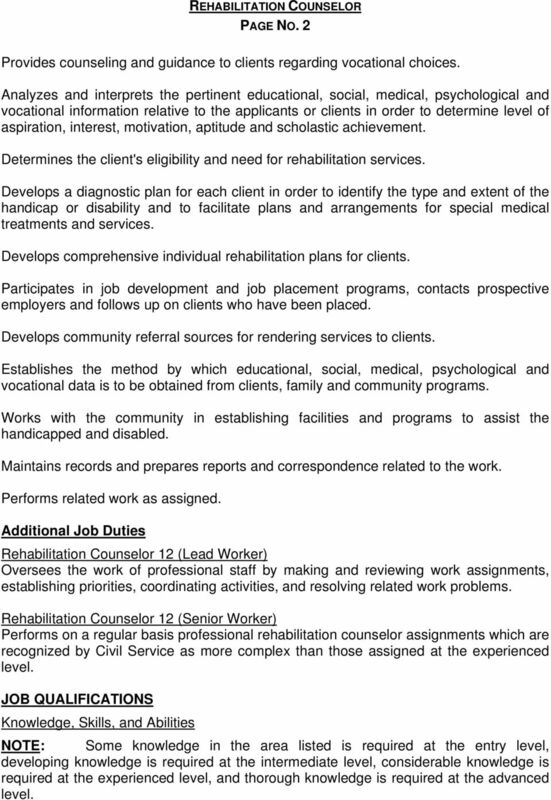 1 MICHIGAN CIVIL SERVICE COMMISSION JOB SPECIFICATION REHABILITATION COUNSELOR JOB DESCRIPTION Employees in this job complete and oversee a variety of professional assignments to provide vocational rehabilitation guidance and counseling to people with mental, physical, or emotional disabilities. There are four classifications in this job. Position Code Title Rehabilitation Counselor-E Rehabilitation Counselor 9 This is the entry level. As a trainee, the employee carries out a range of professional rehabilitation counselor assignments while learning the methods of the work. Rehabilitation Counselor 10 This is the intermediate level. The employee performs an expanding range of professional rehabilitation counselor assignments in a developing capacity. 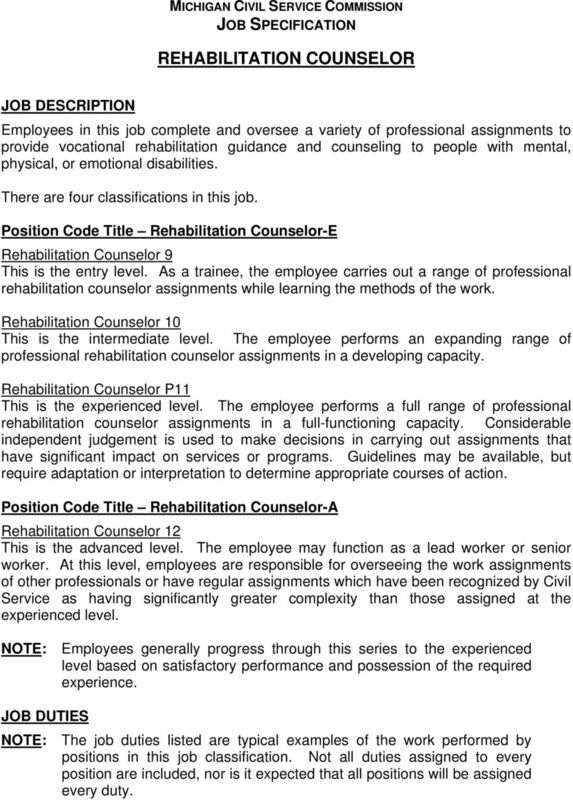 Rehabilitation Counselor P11 This is the experienced level. The employee performs a full range of professional rehabilitation counselor assignments in a full-functioning capacity. Considerable independent judgement is used to make decisions in carrying out assignments that have significant impact on services or programs. Guidelines may be available, but require adaptation or interpretation to determine appropriate courses of action. Position Code Title Rehabilitation Counselor-A Rehabilitation Counselor 12 This is the advanced level. The employee may function as a lead worker or senior worker. At this level, employees are responsible for overseeing the work assignments of other professionals or have regular assignments which have been recognized by Civil Service as having significantly greater complexity than those assigned at the experienced level. NOTE: Employees generally progress through this series to the experienced level based on satisfactory performance and possession of the required experience. JOB DUTIES NOTE: The job duties listed are typical examples of the work performed by positions in this job classification. Not all duties assigned to every position are included, nor is it expected that all positions will be assigned every duty. 2 PAGE NO. 2 Provides counseling and guidance to clients regarding vocational choices. Analyzes and interprets the pertinent educational, social, medical, psychological and vocational information relative to the applicants or clients in order to determine level of aspiration, interest, motivation, aptitude and scholastic achievement. Determines the client's eligibility and need for rehabilitation services. Develops a diagnostic plan for each client in order to identify the type and extent of the handicap or disability and to facilitate plans and arrangements for special medical treatments and services. Develops comprehensive individual rehabilitation plans for clients. Participates in job development and job placement programs, contacts prospective employers and follows up on clients who have been placed. Develops community referral sources for rendering services to clients. Establishes the method by which educational, social, medical, psychological and vocational data is to be obtained from clients, family and community programs. Works with the community in establishing facilities and programs to assist the handicapped and disabled. Maintains records and prepares reports and correspondence related to the work. Performs related work as assigned. Additional Job Duties Rehabilitation Counselor 12 (Lead Worker) Oversees the work of professional staff by making and reviewing work assignments, establishing priorities, coordinating activities, and resolving related work problems. Rehabilitation Counselor 12 (Senior Worker) Performs on a regular basis professional rehabilitation counselor assignments which are recognized by Civil Service as more complex than those assigned at the experienced level. JOB QUALIFICATIONS Knowledge, Skills, and Abilities NOTE: Some knowledge in the area listed is required at the entry level, developing knowledge is required at the intermediate level, considerable knowledge is required at the experienced level, and thorough knowledge is required at the advanced level. 3 PAGE NO. 3 Knowledge of the techniques of rehabilitation counseling and guidance. Knowledge of the principles and methods of rehabilitation training. Knowledge of the psychology of the physically, mentally disabled. Knowledge of different cultures. Knowledge of the limitations and abilities of the disabled. Knowledge of testing techniques, test interpretations, and uses. Knowledge of casework and client interviewing techniques. Knowledge of training and placement facilities and services available to the disabled. 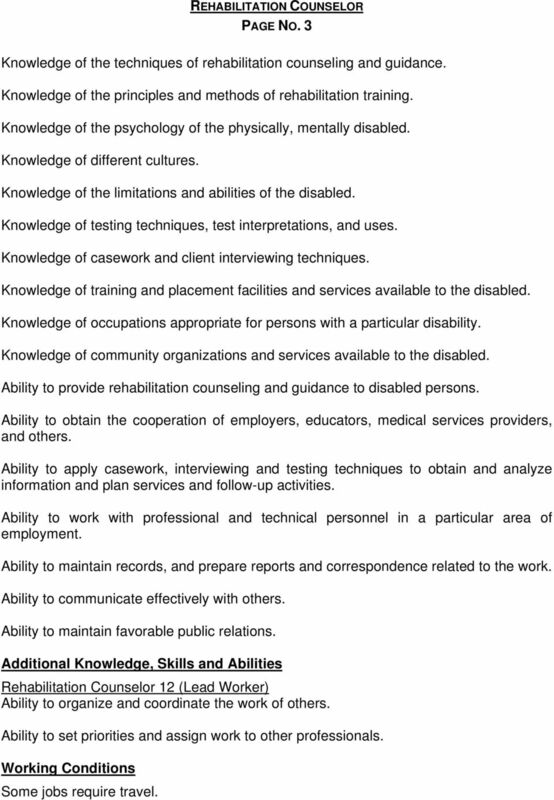 Knowledge of occupations appropriate for persons with a particular disability. Knowledge of community organizations and services available to the disabled. Ability to provide rehabilitation counseling and guidance to disabled persons. Ability to obtain the cooperation of employers, educators, medical services providers, and others. Ability to apply casework, interviewing and testing techniques to obtain and analyze information and plan services and follow-up activities. Ability to work with professional and technical personnel in a particular area of employment. Ability to maintain records, and prepare reports and correspondence related to the work. Ability to communicate effectively with others. Ability to maintain favorable public relations. Additional Knowledge, Skills and Abilities Rehabilitation Counselor 12 (Lead Worker) Ability to organize and coordinate the work of others. Ability to set priorities and assign work to other professionals. Working Conditions Some jobs require travel. 4 PAGE NO. 4 Some positions may be located in a mental hospital, correctional facility, veterans hospital, or other partner organizations. Physical Requirements None. Education Possession of a master's degree with a major in counseling, rehabilitation counseling, or a counseling-related field such as psychology, social work, or special education. 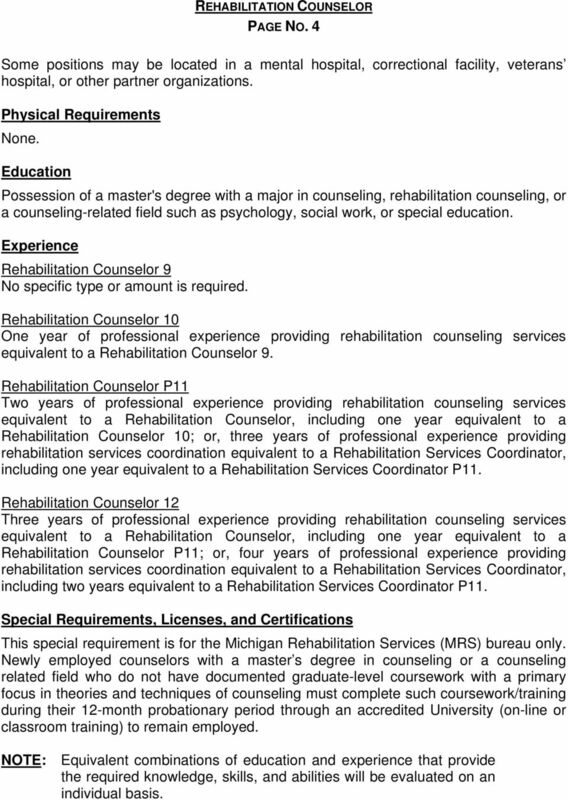 Experience Rehabilitation Counselor 9 No specific type or amount is required. Rehabilitation Counselor 10 One year of professional experience providing rehabilitation counseling services equivalent to a Rehabilitation Counselor 9. Rehabilitation Counselor P11 Two years of professional experience providing rehabilitation counseling services equivalent to a Rehabilitation Counselor, including one year equivalent to a Rehabilitation Counselor 10; or, three years of professional experience providing rehabilitation services coordination equivalent to a Rehabilitation Services Coordinator, including one year equivalent to a Rehabilitation Services Coordinator P11. Rehabilitation Counselor 12 Three years of professional experience providing rehabilitation counseling services equivalent to a Rehabilitation Counselor, including one year equivalent to a Rehabilitation Counselor P11; or, four years of professional experience providing rehabilitation services coordination equivalent to a Rehabilitation Services Coordinator, including two years equivalent to a Rehabilitation Services Coordinator P11. Special Requirements, Licenses, and Certifications This special requirement is for the Michigan Rehabilitation Services (MRS) bureau only. Newly employed counselors with a master s degree in counseling or a counseling related field who do not have documented graduate-level coursework with a primary focus in theories and techniques of counseling must complete such coursework/training during their 12-month probationary period through an accredited University (on-line or classroom training) to remain employed. NOTE: Equivalent combinations of education and experience that provide the required knowledge, skills, and abilities will be evaluated on an individual basis. RHODE ISLAND DEPARTMENT OF HUMAN SERVICES OFFICE OF REHABILITATION SERVICES Section 115.10 POLICY AND PROCEDURES MANUAL Rev.